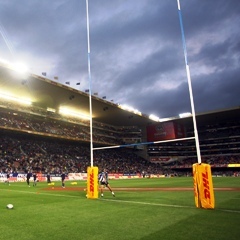 Cape Town - Embattled Western Province Rugby have had to move to deny to their clubs that, despite rumours swirling to the contrary, an agreement is already in place over the sale of Newlands. It is known to Sport24 that Thelo Wakefield, president of the cash-strapped WPRFU, issued an “urgent message” to their almost 100 clubs this week, responding to an email circulated to clubs from lawyers representing Aerios, the commercial partner at long-time, ongoing legal loggerheads with them - with a multimillion-rand claim - over advertising rights. “(We) are in discussions with the WPRFU ... that is as advanced as it is at this stage,” Southern Palace chief executive Lucas Tseki said. The lawyers, under instruction from Aerios, advised clubs that they delivered notices under the Promotion of Access to Information Act to the Union and the City of Cape Town - owners of Cape Town Stadium, where WP Rugby is expected to move after the 2018 season - in order to “obtain further information regarding the sale of the stadium (Newlands) and in order to obtain copies of any documents relating to the sale”.